Diagnosis of multiple myeloma can be made without several lytic bone lesions: There are two important variants of multiple myeloma that must be considered, solitary bone plasmacytomas (SBP) and extramedullary plasmacytomas (EP). SBP is a single lytic bone lesion without signs of extensive bone marrow plasmacytosis. Whereas EP is usually localized to paranasal sinuses and the nasopharynx in submucosal lymphoid tissue again without bone marrow plasmacytosis. Importantly they are both highly responsive to radiation therapy. Increased risk of infections: Increases in the breakdown of normal immunoglobulins results in "immunoparesis" whereby there is hypogammaglobulinemia  and invariably impaired humoral-mediated immunity leading to increased incidences of sinupulmonary infections with organism such as pneumococcus, Staphylococcus aureus and Klebsiella pneumoniae. The cause of renal impairment is multifactorial:  Hypercalcemia causing afferent arteriolar constriction and polyuria leading to volume contraction along with cast nephropathy from monoclonal free light chains precipitating and causing tubular obstruction can all work in concert to potentiate renal dysfunction. Use plain radiographs for skeletal survey: A bone scan in myeloma is not useful given reduced sensitivity for detecting osteolytic lesions which is typical of myeloma; the osteoblastic lesions which are seen in metastatic disease are on the contrary well-recognized in bone scans. MGUS is more common than myeloma: MGUS occurs in about 1% of the population over age 50 and roughly about 10%  of the population aged > 75. 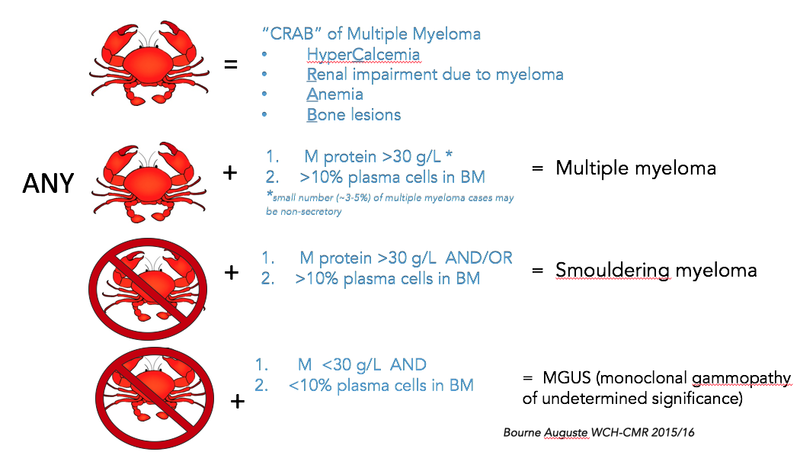 Diagnosis of MGUS is made when patients have <10% bone marrow plasma cells and < 30 g/L  of M protein and the absence of any "CRAB" (see figure 1). Roughly about 1% per year of patients with MGUS will eventually develop myeloma. 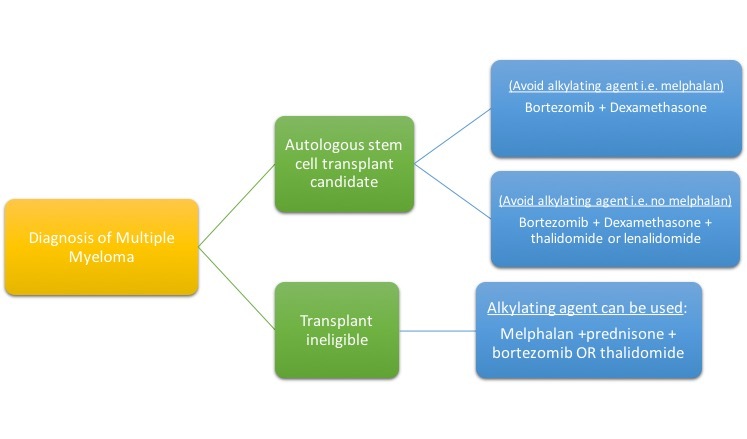 Figure 1: An oversimplification of the diagnostic criterion for MGUS, smouldering and multiple myeloma. Additionally the revised International Myeloma Working Group criteria now allows in addition to the classic "CRAB" features, the following three markers as “myeloma defining events” (MDEs). ≥60% clonal plasma cells on bone marrow examination. More than one focal lesion on MRI that is at least 5 mm or greater in size. The presence of any one of these MDEs even in the absence of other "CRAB" is enough to consider a diagnosis of multiple myeloma. Sources: http://www.ncbi.nlm.nih.gov/pubmed/19020545 (International Myeloma Working Group. International Myeloma Working Group guidelines for serum-free light chain analysis in multiple myeloma and related disorders).